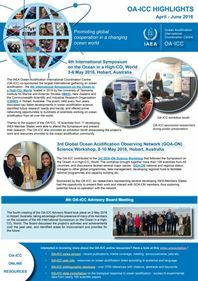 Ocean acidification is well covered in the Working Group II contribution to the IPCC Fifth Assessment Report (Climate Change 2014: impacts, adaptation and vulnerability) released today, 31 March 2014. 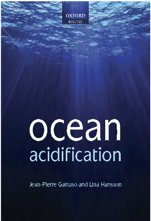 Several experts of ocean acidification were involved as authors or review editors: P. Boyd, P. Brewer, V. J. Fabry, J.-P. Gattuso, O. Hoegh-Guldberg, Y. Nojiri, H.-O. Pörtner, D. Schmidt and C. Turley. Gattuso J.-P., Brewer P., Hoegh-Guldberg O., Kleypas J. A., Pörtner H.-O. & Schmidt D., 2014. Ocean Acidification. In: Field C. et al. (Eds. ), Climate Change 2014: Impacts, Adaptation and Vulnerability. Contribution of Working Group II to the Fifth Assessment Report of the Intergovernmental Panel on Climate Change. Cambridge: Cambridge University Press. Field C., Barros V., Mach K., Mastrandrea M., van Aalst M., Adger N., Aldunce P., Arent D., Barnett J., Betts R., Bilir E., Birkmann J., Carmin J., Chadee D., Challinor A., Chatterjee M., Cramer W., Estrada Y., Gattuso J.-P., Hijioka Y., Hoegh-Guldberg O., Huang H.-Q., Insarov G., Jones R., Kovats S., Romero Lankao P., Nymand L. J., Losada I., Marengo J., McLean R., Mearns L., Mechler R., Morton J., Niang I., Oki T., Olwoch J. M., Opondo M., Poloczanska E., Poörtner H.-O., Redsteer M. H., Reisinger A., Revi A., Schmidt D., Shaw R., Solecki W., Stone J., Strzepek K., Suarez A., Tschakert P., Valentini R., Vicuna S., Villamizar A., Vincent K., Warren R., Wilbanks T., Wong P. P. & Yohe G., 2014. Technical summary. In: Field C. et al. (Eds. ), Climate Change 2014: Impacts, Adaptation and Vulnerability. Contribution of Working Group II to the Fifth Assessment Report of the Intergovernmental Panel on Climate ChangeCambridge: Cambridge University Press. Gattuso J.-P., Hoegh-Guldberg O. & Pörtner H.-O., 2014. Coral Reefs. In: Field C. et al. (Eds. ), Climate Change 2014: Impacts, Adaptation and Vulnerability. Contribution of Working Group II to the Fifth Assessment Report of the Intergovernmental Panel on Climate Change. Cambridge: Cambridge University Press. Below are excerpts of the executive summaries of chapters 5, 6 and 30. Coastal ecosystems are particularly sensitive to three key drivers related to climate change: sea level, ocean temperature and ocean acidification (very high confidence)[5.3.2, 5.3.3.4, 5.3.3.5]. Despite the lack of attribution of observed coastal changes, there is a long-term commitment to experience the impacts of sea level rise because of a delay in its response to temperature [5.5.8] (high agreement). In contrast, coral bleaching and species ranges can be attributed to ocean temperature change and ocean acidity [5.4.2.4, 5.4.2.2]. For many other coastal changes, the impacts of climate change are difficult to tease apart from human-related drivers (e.g. land-use change, coastal development, pollution) (high agreement, robust evidence). Rising atmospheric CO2 over the last century and into the future not only causes ocean warming but also changes carbonate chemistry in a process termed ocean acidification (WGI, Chs. 3.8.2, 6.4.4). Impacts of ocean acidification range from changes in organism physiology and behavior to population dynamics (medium to high confidence) and will affect marine ecosystems for centuries if emissions continue (high confidence). Laboratory and field experiments as well as field observations show a wide range of sensitivities and responses within and across organism phyla (high confidence). Most plants and microalgae respond positively to elevated CO2 levels by increasing photosynthesis and growth (high confidence). Within other organism groups, vulnerability decreases with increasing capacity to compensate for elevated internal CO2 concentration and falling pH (low to medium confidence). Among vulnerable groups sustaining fisheries, highly calcified corals, mollusks and echinoderms, are more sensitive than crustaceans (high confidence) and fishes (low confidence). Trans-generational or evolutionary adaptation has been shown in some species, reducing impacts of projected scenarios (low to medium confidence). Limits to adaptive capacity exist but remain largely unexplored. [6.3.2, CC-OA]. Uptake of CO2 has decreased ocean pH (approximately 0.1 unit over 100 years), fundamentally changing ocean carbonate chemistry in all ocean sub-regions, particularly at high latitudes (high confidence). The current rate of ocean acidification is unprecedented within the last 65 Ma (high confidence) if not the last 300 Ma (medium confidence). Warming temperatures, declining pH and carbonate ion concentrations represent risks to the productivity of fisheries and aquaculture, and the security of regional livelihoods given the direct and indirect effects of these variables on physiological processes (e.g., skeleton formation, gas exchange, reproduction, growth, and neural function) and ecosystem processes (e.g., primary productivity, reef building, and erosion) (high confidence) [6.2, 6.3, 30.3.1, 30.3.2; 6.1.2; WGI 3.8.2, Box 3.2, 5.3.1]. Regional risks and vulnerabilities to ocean warming and acidification can be compounded by non-climate related stressors such as pollution, nutrient runoff from land, and over-exploitation of marine resources, as well as natural climate variability (high confidence). These influences confound the detection and attribution of the impacts of climate change and ocean acidification on ecosystems yet may also represent opportunities for reducing risks through management strategies aimed at reducing their influence, especially in CBS, SES, and HLSBS [30.1.2, 30.5, 5.3.4, 18.3.3–4]. The productive EBUE and EUS involve upwelling waters that are naturally high in CO2 concentrations and low in pH, and hence are potentially vulnerable to ocean warming and acidification (medium confidence). There is limited evidence and low agreement, as to how upwelling systems are likely to change (low confidence). Declining O2 and shoaling of the aragonite saturation horizon through ocean acidification increases the risk of upwelling water being low in pH and O2 with impacts on coastal ecosystems and fisheries, as has been seen already (e.g., California Current EBUE). These risks and uncertainties are likely to involve significant challenges for fisheries and livelihoods along the west coasts of South America, Africa, and North America (low to medium confidence) [30.3.2.2, 30.5.2, 30.5.5, Box CC-UP, Box CC-PP]. Working Group II contribution to the IPCC Fifth Assessment Report, 31 March 2014. Report.